Over the last couple of weeks, throughout school, we’ve been involved in learning related to national anti-bullying week. As a result of this, we’ve decided to add some things about bullying to our website so that everyone is really clear about what bullying is and the steps that should be taken to help if you are worried about bullying. As part of this information, we’ve also included an exciting update on some special training we’ve been undertaking with our year 6 children. 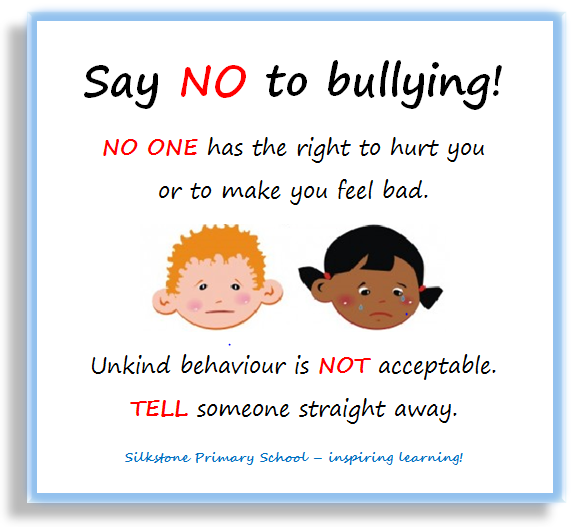 If you’d like to know more about what Year 6 are doing and to find out more about how to deal with bullying, please follow this link to our Say NO to bullying page.